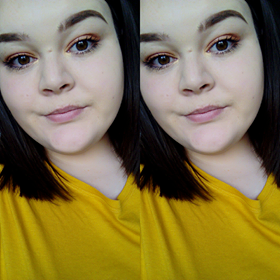 So recently I've been struggling with my Body Confidence, and i know that I'm not alone with this, people struggle day to day with confidence and i know what helps me is seeings quotes or having advice. So here is 5 of my top body confidence tips! Wear clothes that show off your "good bits" and that make you feel better about the parts of your body you hate the most. Always buy the right fit, and make sure you are comfortable. Never wear something because you want to look good for someone else. Always dress for yourself. Boys do not know your insecurities and their forth wont be picking out things they dis like about you. Remember, Personality over everything! 3. "Fake it till you make it"
Even if you don't feel confident, Keep that head up and that smile plastered on your face, and no one will know the difference. A smile will make you look 100% more confident. Fake tan, Wear make up, or clothing that makes you feel amazing about your self, this will all help to boost your body confidence. Clean eating is key, The healthier you eat the better you are going to feel, WATER, water helps with everything, so drink as much as you can! There is always going to be days where you want to eat pizza and chocolate and cake and lounge around, and no one is stopping you! Having a friend or a friends to bounce off really helps. Its not always the case that your friend is going to be right by your side, but drop them a text. Sometimes all you need if for someone to give you a kick up the bum and to tell you you're beautiful. Its good to be reminded of how amazing you are!